The overhauling of the traditional setup of restaurants has given us so many exciting options to choose from. The healthy competition among restaurants has uplifted the overall dining experience. Although every restaurant boasts of its pleasing ambience, top-notch services and great food but only a handful have great customer reviews. What excites someone other than delicious food to visit a restaurant? It's uniqueness. The restaurants now days aren’t only about serving food but they are also about providing mesmerising experience to families, friends as well as couples visiting them. If you are looking to have an impeccable experience in Gurugram, then The Mellow Garden should be on the top of your priority list. Amidst all the hundreds of restaurants in Gurugram, one stand tall; The Mellow Garden. The garden-theme based restaurant situated in South city II, Gurugram offers you world-class ambience and matchless services along with great food. It holds proficiency in organising family get-togethers, Kittie parties, evening tea parties, and any kind of social events. This family-oriented restaurant is the only garden based theme restaurant in Gurugram, which makes it more special. The ambience is the most convincing aspect of the restaurant. The garden theme truly energises and engages the visitors. The feel of nature amidst the heart of the city gives a lifelong unforgettable experience. It works as a ladder out of chaos and soothes you from within. The touch of nature with all modernised amenities makes it a perfect place to dine at. The Rooftop view, outdoor seating, ample parking and free Wi-Fi connectivity excites you for another visit. Kids need space to cherish outings. 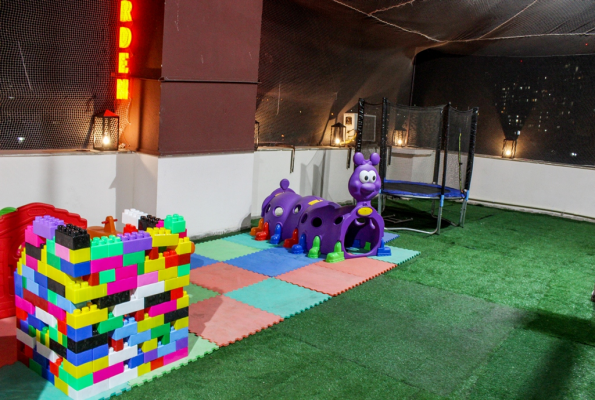 The availability of a gaming zone for kids ensures a smooth and enjoyable social gathering. Very few restaurants across the city provide a kid-friendly environment. This eliminates the clumsy experience people usually have in restaurants. It’s always a delight to see kids properly enjoying an outing or a social gathering. The Mellow garden is a garden full of flavours. Right from soups to sizzling starters and main course it serves everything. The food quality here is uncompromised and precisely focused on providing an unforgettable experience. Visitors can choose and order from an everlasting list of lip-smacking Indian & Chinese cuisines curated by the master chefs. The menu has both veg and non-veg dishes on the offering, increasing the variety of food on the table. The daily changing menu is another exciting prospect of the restaurant. The services are all concentrated on enriching customer satisfaction. The hassle-free reservation system is another talking point of the restaurant; a simple call would do the booking. Home delivery via Swiggy and Foodpanda contributes further to customer’s accessibility to the delicious food. The great customer reviews and exciting testimonials across various social media channels (Facebook, Twitter) and food delivery platforms (Swiggy, FoodPanda) are proof of the quality of the restaurant. A true mixture of perfect ambience, great food and unparalleled service awaits you at South city II, Gurugram.